The tutorials of IEEE-VPPC 2010 are hold at the main campus of University of Lille 1 on Tuesday, 31st August 2010 from 9:30 to 17:30. The main campus of University of Lille 1 referred-to as “Cité Scientifique” is located in Villeneuve d'Ascq area in Lille suburb. From Lille downtown to the University of Lille 1 (15 min) - PDF format, click here. Take the subway "Ligne 1 direction 4 Cantons'' and get off at ''Cité Scientifique''. There is then a 5 min walk from the station “Cité Scientifique” to the building P2 or to the building IUT. Subways operate every day from 5:00 AM to 12:00 PM. They run every 3 or 4 min. 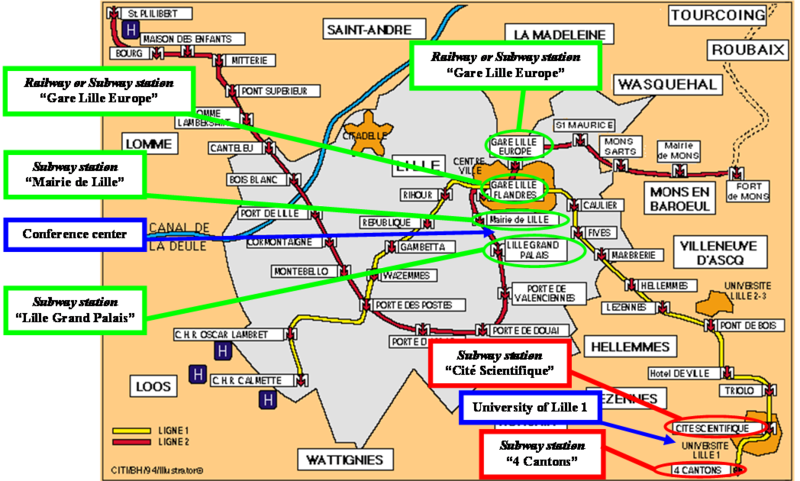 More information about the subway of Lille (tickets, maps, routes...), go to the website of Transpole.